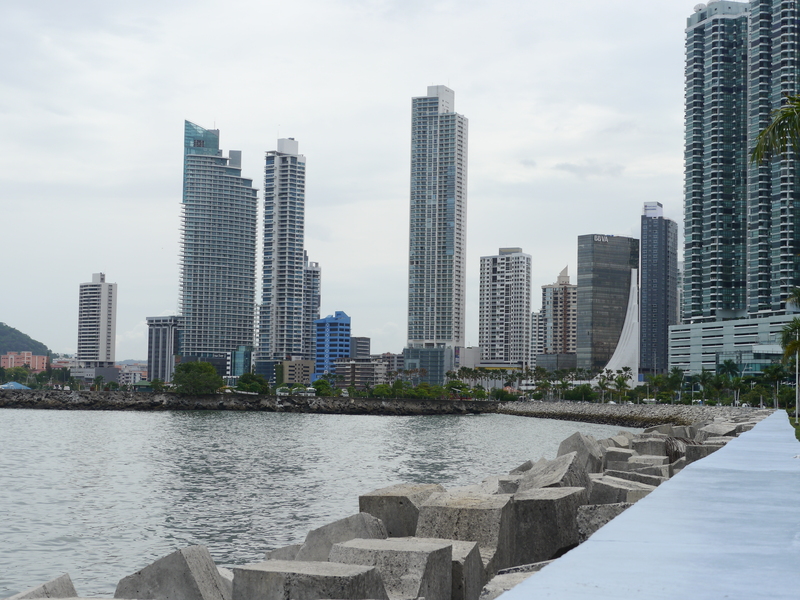 Taking the bus in Panama City in some ways is extremely easy, and in other ways is very challenging … especially if, like me, you know only a handful or two of Spanish words. Here’s how to do it, everything from buying a Metro Card to getting out of town. 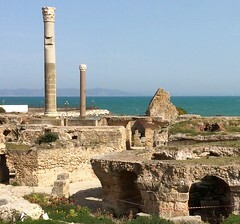 If you find this post useful, please have a look around the rest of my website for other tips about where to go, what to see, do and eat, and logistics on how to do it easily. I’d love it if you subscribed so you get notifications of all my new articles in your inbox, and if you’d follow me on social media. Panama’s Tocumen Airport: Need to know. and lots more on the Travel Practicalities page, including how to avoid scams and easy tips for travelling respectfully in Buddhist countries. 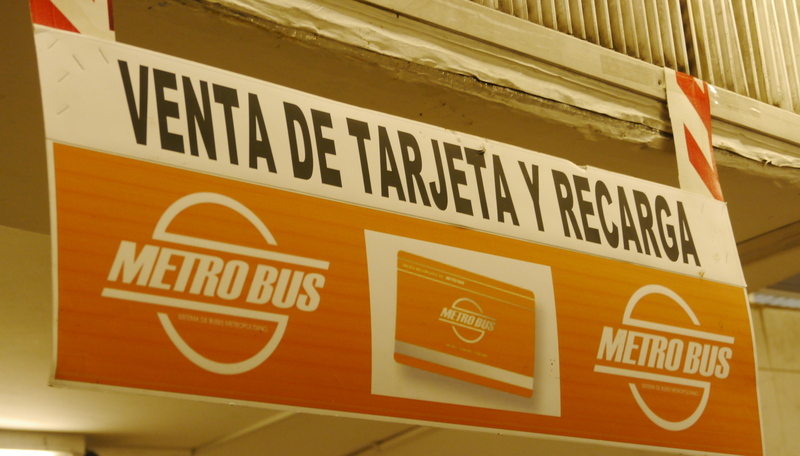 Panama City’s buses, called Metro Buses, do not take cash, so your first job will be buying a Metro Card. Metro Cards are sold at some supermarkets as well as at the Albrook bus station (you’ll have to take a cab to get there). Keep in mind that not every place that sells Metro Cards has the capacity to charge them. You want both. Look for a Venta de Tarjeta y Recarga sign. Your best bet without having to taxi to Albrook is a big supermarket, but there is also a little shop near Plaza 5 de Mayo (look for the lineup on the sidewalk). At the supermarket, the Metro Bus sign will be above one of the cash registers (although likely not facing where you line up, but rather facing the other cash registers). Most commonly, the Metro Card register will be at the far end, and it is very likely to have a long line of people. Remember, Panamanians’ income is a lot lower than yours. Many people can only afford to charge their card up a dollar or two at a time. A Metro Card costs $2, and then you can add however much money you think you’ll need on to the card. Most city rides cost 25 cents, although the cost is $1.25 if you travel along Corredor Nord or Sur or go to Tocumen International Airport (this latter route takes about two hours from Albrook). Look for bus stops on the major streets like Balboa or Central avenues. 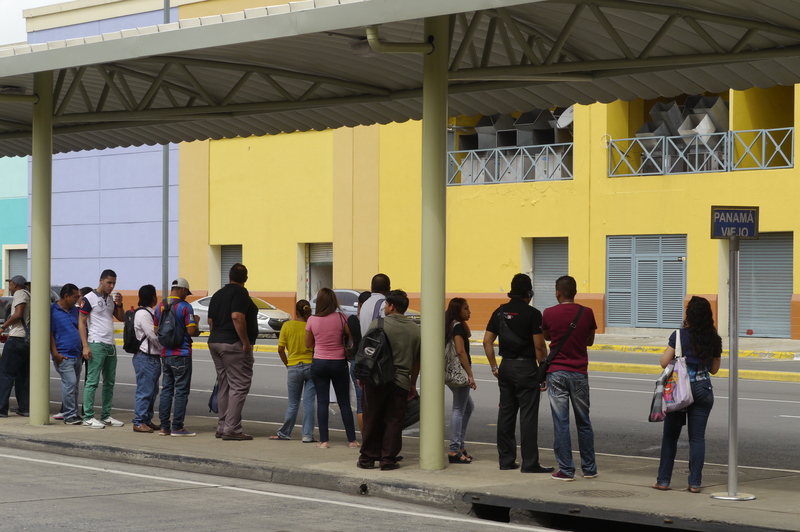 In Panama, like in Vancouver, locals line up politely for their bus. This is a necessity in Panama, where the demand far outweighs the supply, particularly at rush hour. You need to wave down the bus you want. The buses don’t have numbers, but the route is on the front window. You’ll need to know your streets a little to get around. If you’re not near a bus stop and you see the bus you want coming, you can wave it down. The driver is likely to stop for you. When you get on the bus, there is a card reader behind the driver’s right shoulder. Just hold your Metro Card up (put the little square on the back of your card toward the machine). The machine will beep, and the cost of the ride and your remaining balance will flash on the screen. You can use the same card for more than one passenger. Push your way through the turnstile and find a seat (note the front seats are reserved for people with disabilities). To get off the bus, push one of the red buttons on the poles. If you realize that the bus is about to turn, for example on to one of the freeways, and you should have gotten off at the last stop, smile at the driver and indicate your error and he’ll likely let you off before he goes too far. If you want to transfer to another bus: when you exit, flash your card at the card reader at the back turnstile, and you’ll have 40 minutes to take another bus without charge. What about those crazy buses blaring music? These are the diablos rojos or red devils. If you want to sample a ride on one, you’d best be quick because they are being phased out (and when they are all gone, the cost of a Metro Bus ride will rise to 65 cents). Each diablo rojo bus is owned individually. They are decorated to the taste of the owner/driver and help to attract passengers. They often travel with their door open, to give occupants a cooling breeze. Diablo rojo rides cost 25 cents (cash!) in the city, more beyond depending on distance traveled. You pay when you exit the bus; the driver will have change. If you are travelling with a bag of any real size, leave it by the driver (the seats and aisles are full enough of people … there is no room for your backpack!). Almost all buses, whether they be Metro Buses or diablos rojos, go to and from Albrook bus station (Gran Terminal Nacional de Transporte). 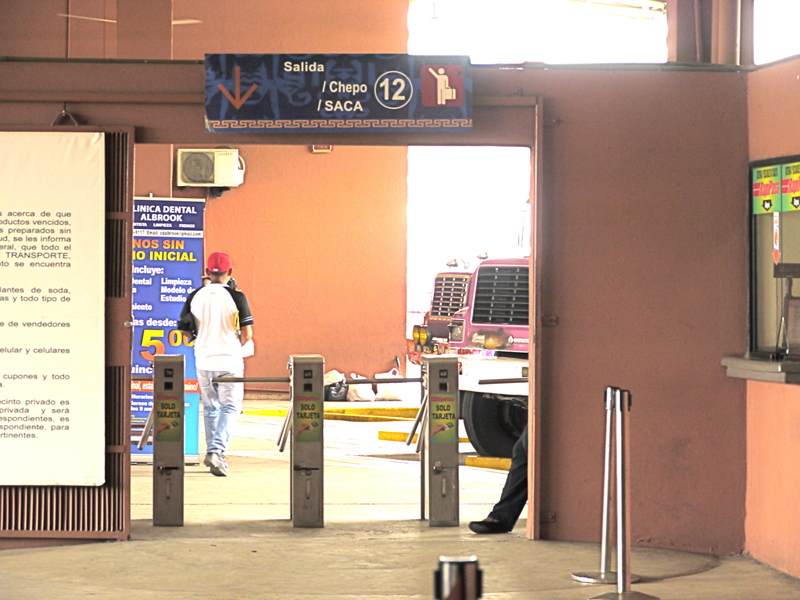 Getting to Albrook is easy — just hop on any bus that says “Albrook”. 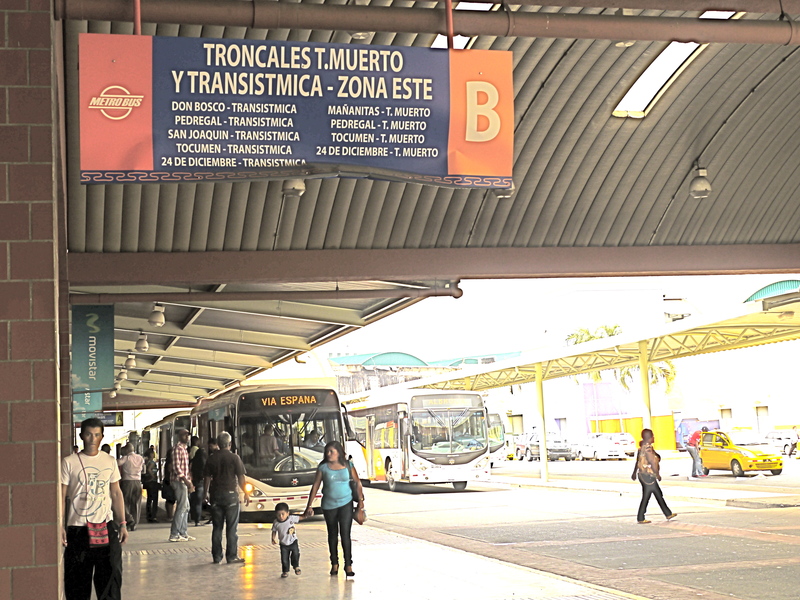 If your next destination from Albrook is via Metro Bus, your next step is also easy. Catch your bus along the left (west, close to the mall) side of the terminal. There are about five groupings of destinations along the inner section, big signs list the destinations. Just wait under your sign. If you’re going to Panama Viejo, the stop is on the outer section at the north end, near the yellow wall of the mall building (see below). There are a number of other places in the city to catch a Panama Viejo bus, particularly along Avenida Balboa. However, some destinations are not reached via Metro Bus. This is where things can get a little complicated. Bring a dime per person, your destination written on a piece of paper (preferably clearly printed in Spanish), and plenty of smiles. 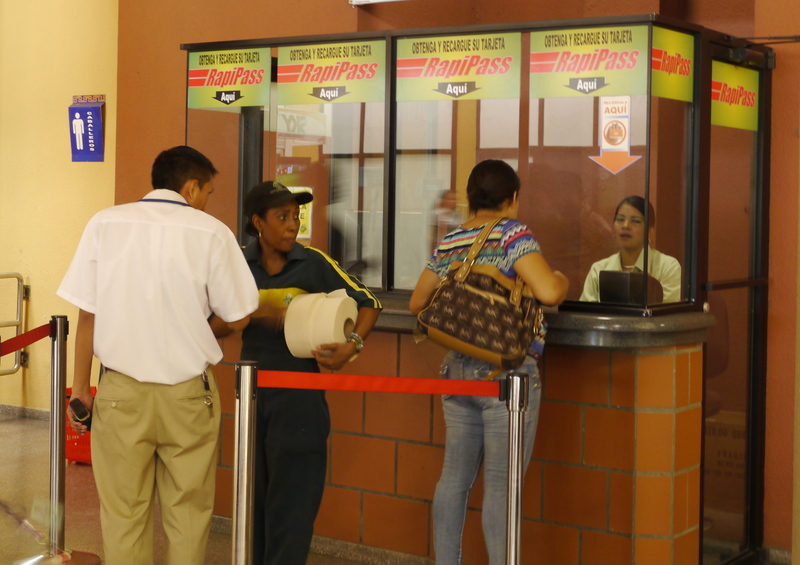 Buy tickets for major cities in Panama as well as Costa Rica (the Tica Bus) at the ticket booths in the middle of Albrook. They’re clearly labelled, and you’ll be given a ticket which shows your exit / waiting room number. Sometimes you show your ticket to the bus driver, sometimes you don’t need to; keep it handy just in case. To get to the Miraflores locks, Pedro Miguel lock, Summit National Park, and the Summit Botanical Garden and Zoo (i.e. 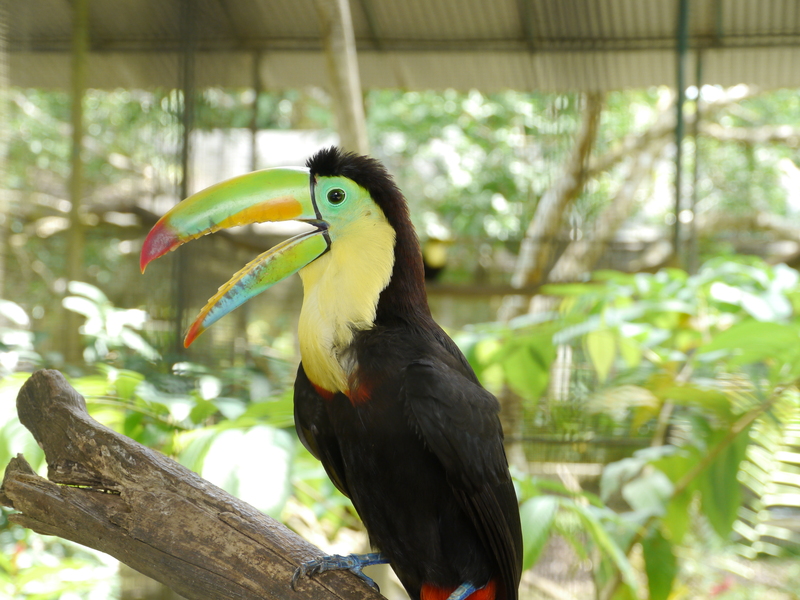 animal rescue centre), you will need a bus headed to Gamboa. There is not a bus labelled Gamboa. 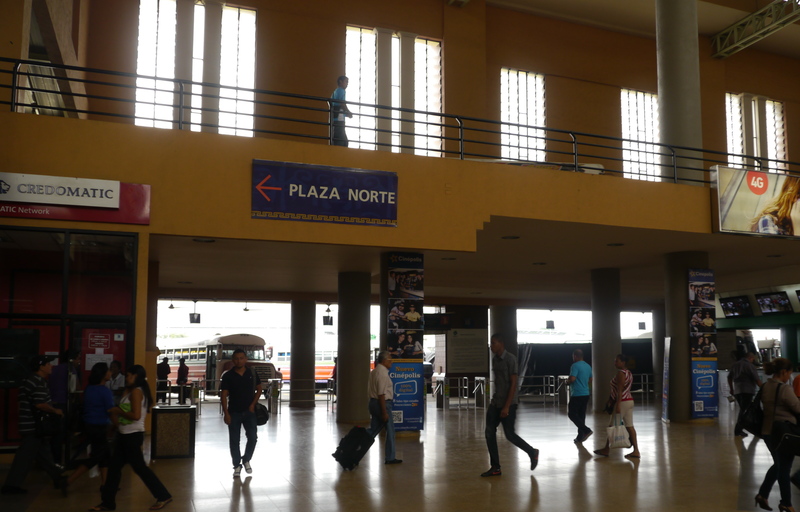 Go into the interior of Albrook bus station and walk all the way toward the north end (look for the big Plaza Norte sign pointing you north). There is a food court here – KFC, McDonald’s, Dairy Queen, but also the local Nico’s, a better choice if you’re hungry. Keep walking all the way to the end, past the Burger King, and then turn right. You will see a sign marked for exit (salida) 12. This is your door. There is a set of turnstiles and a ticket booth. To get through the turnstiles you need to pay a 10 cent tax. Most people do this with their RapiPass card, which is, sadly, not compatible with the Metro Card system. If you plan on a lot of trips, buy a RapiPass card. You can get one at exit 12 or at booths within Albrook. If this is your one big adventure on the bus and you won’t need a RapiPass, then have a dime handy and convince someone to swipe you through the turnstiles with their card in exchange for your dime. This can be done with big smiles, apologetic looks and no Spanish other than “muchas gracias”. Many people told me that the Gamboa bus would say “Gamboa” or “Coop SACA” on it. It did not. But keep repeating “Gamboa” and your destination (show them your paper if you’re not confident of your pronunciation) and someone will point out the correct bus. Panamanians are very kind and helpful. The bay at door 12 fits about four buses. For me, the Gamboa bus was the furthest bus. And yes, it was a red devil. Show the driver your paper with the destination on it to make sure he knows where you want him to stop. Thank him profusely. Squish into a seat (if you’re lucky). It is about 10 km to Miraflores locks, and you can see them coming easily though a window. The museum building is tall and white, and you can see the locks behind them as your approach. Once you’re off the bus, you’ll need to walk across the bridge to your left about 15 minutes to get to the locks building. Watch for crocodiles beneath the bridge! The Pedro Miguel lock is about another 5 km further. Don’t be alarmed when the bus goes into a small residential neighbourhood before it returns to the highway. 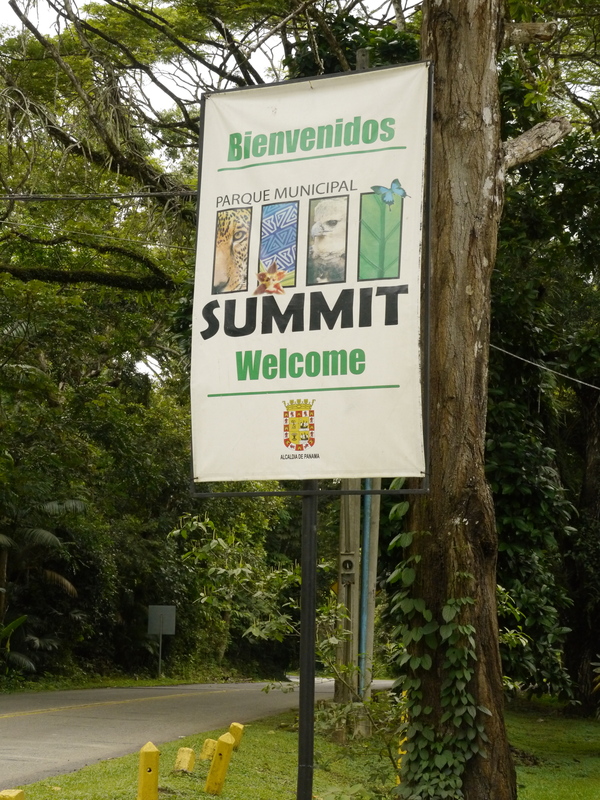 Your next major landmark is a big sign marking the entrance to the Summit National Park. A few kilometers further you’ll pass a sign for the Radisson Hotel and Golf Club on your right. Pay the driver as you get off the bus. The cost is 65 cents to the botanical gardens. But if the driver has been really kind to you, as mine was, return the change to him. There are only vague schedules for the return trip. Ask around to get an approximate time, and return to the bus stop (right across the street from the Summit entrance) at least 15 minutes prior to that. Be prepared to wait. A few taxis will also drive by empty of passengers (near Summit, most will be full) and you can wave one down. Taxis wait at Miraflores — negotiate your price to your next destination! Panama City is building a magnificent subway system, slated to open in early 2014. This system will go a very long way in alleviating Panama City’s transportation problems. 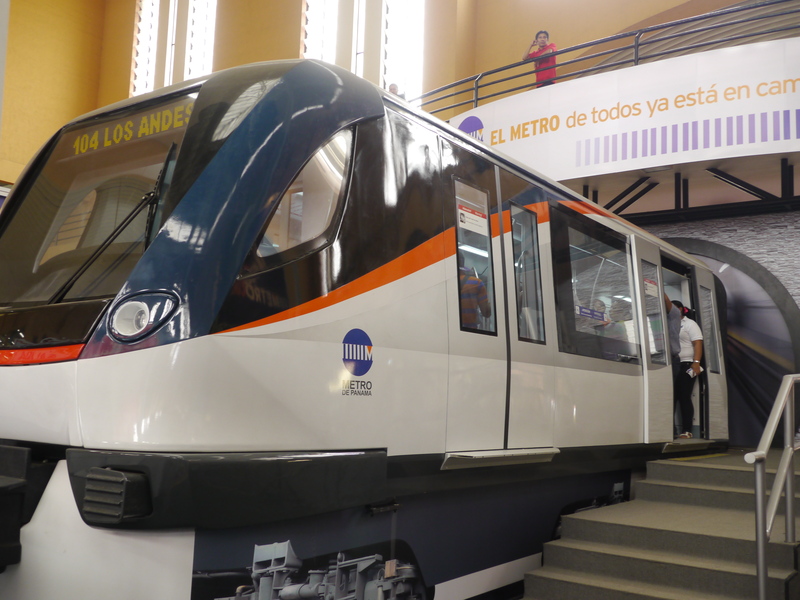 The ride from Los Andes to Albrook terminal will take only 23 minutes. Right now, locals and tourists alike can try out the new subway car on a mini-tour in the middle of Albrook bus station (above). 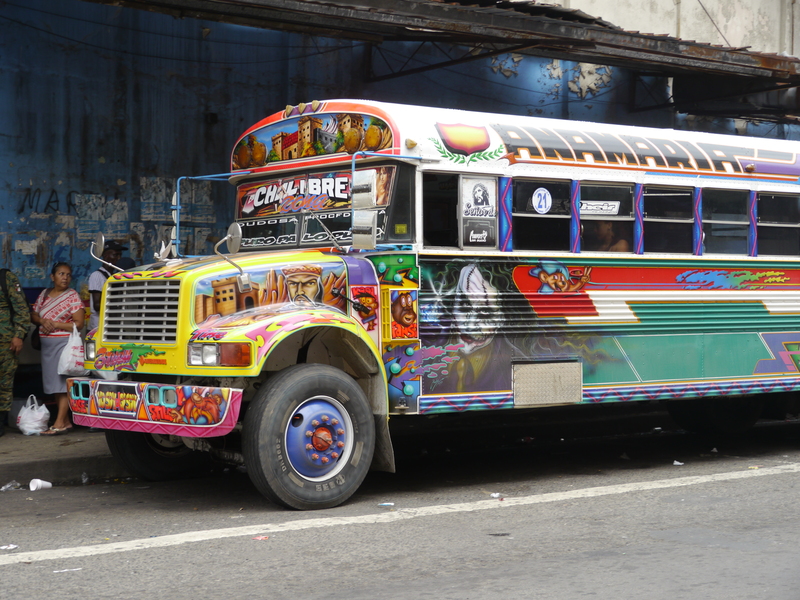 Do you have any tips on taking the bus in Panama City? Please share! As per a lot of other updates, getting to Miraflores is much easier these days. Getting back looked like it was going to be more challenging, however, it turns out that a bus goes back to Albrook every half hour from in front of the Visitor Centre. I found a useful app called MiBus. Seems great so far, however neither the app nor Google Maps showed the return bus as being an option so it obviously has its limitations. Thanks Cassandra — that’s really helpful. Appreciate it! This is a great article. Thank you for all of this information. If I may make a suggestion. You wrote this in 2014 before the Metro Subway came online. A new update with “where to purchase” metropass cards along with current prices would be helpful for future viewers of your blog post. Coronado to Boquete on Feb 29th. We have luggage & gold clubs. Any suggestions? Suggestions for how to travel between the two? Bus is the cheap and easy option but of course it depends on your preferences and budget. Consulting a travel agent will get you the most accurate info. Very well done article, thanks for the tips! Indeed, Panama is one of the most important shipping routes in the world, due to its strategy location between North and South America that links the North Atlantic Ocean with the North Pacific Ocean. A cruise on the Panama Canal is thus, one not to be missed. Do be wary of the gold / emerald shop price scam, fake towel charge, airport unofficial taxi robbery, carjacking, drug set-up, fraudulent money changers, unsolicited tours, hostel attacks and many more! Thanks David. It is possible to be scammed anywhere in the world, but I wouldn’t want to fearmonger or for people to think that Panama is any worse than any other country. Thanks (Gracias) so much for explaining the purpose of the Scanner at the EXIT – to be used for TRANSFERS. Always wondered about that. Been to Panama many times since 2012 and only figured that out now from your website! Thanks for the info. And yes — Uber certainly does make it easier! It wasn’t in Panama yet when I wrote this article :-) Thanks for letting everyone know about it ! Great advice — many thanks for letting us know! Loved Panama! And loved the public transportation. It is so cheap, and I’m brazilian, not comparing with London or San Francisco. Here in Rio we pay 1.15 dollar for a bus ride, 1.30 for a subway ride, other brazilian citys you can pay as much as 1.50. Spending less than 8 dollars for a lot of bus rides was so cheap for me, including the round trip from the airport! Just wanted to say thanks for taking the time to blog about this! I am headed to Panama for the very 1st time this month and never thought about taking the bus. BUT now I am in order to try and mingle with the locals outside of the tourist areas… Hopefully I will meet some friendly faces on my bus ride! Many thanks! Be sure to read all the comments from people who visited more recently than me. I found everyone I met in Panama to be super nice and very helpful (despite my limited Spanish). I’m sure you will too. Have a wonderful trip! I just went to Miraflores Locks today (3-Aug-2017). There is now a standard modern Metro bus that leaves from Albrook, going to Miraflores. You catch it in the same long row of buses in front of the station where all the other buses arrive & leave from. No need to go through the turnstile area for 10 cents, no need for a red devil bus. At time of this writing it cost only 25 cents. You can ask one of the transit guys exactly where to wait for the bus since it is a super long boarding area. I remember it was way towards the north end, I think letter “E” or “F”. 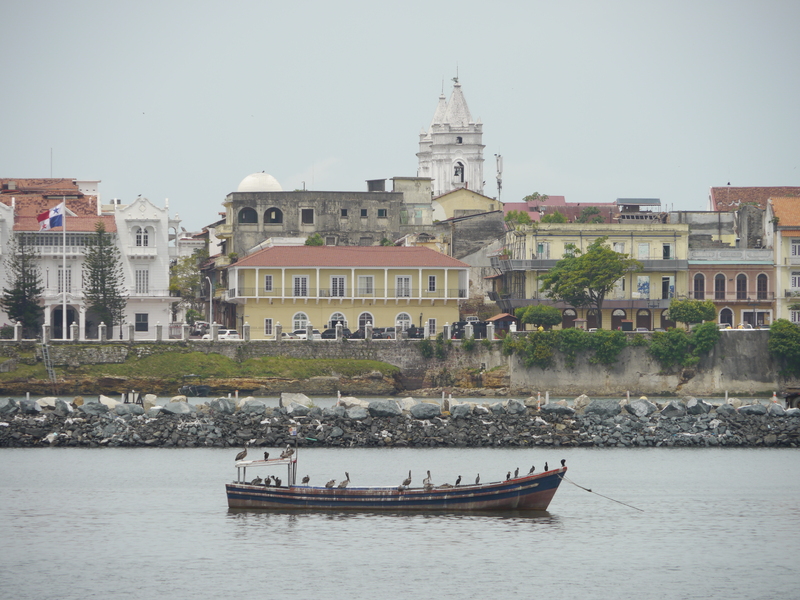 And here’s the best part… the bus turned down the road to Miraflores docks! We all got off directly in front of the visitor center. So no need to walk down the little road at all anymore. I’m sharing your website with my Creative Writing class. We are creating a travel blog for our next project. Your page looks great! Hi this is all great information. We only landed at Tocumen yesterday and wanted to avoid paying $30 for a cab so we walked out of the airport to the main road, crossed a roundabout to the bus stop. The first bus that came along was marked Albrook we got on and because we never had a pass the driver just waived us on. It did take a while to get in to the city but we only had a $4 taxi to our Airbnb at the end. Great — so glad to hear my info was helpful. Please feel free to share the article! Very nice of the bus driver to just let you on the bus too. Enjoy Panama! Diablos Rojos now charge 50 cents cash. They now will only pick you up or drop you off at designated bus stops. They are not secure and a terrible experience. The metro currently deducts 35 cents from the metrobus card but that may increase when they finish line 2 which is about half complete.There is no good website that does a decent job at explaining/showing the bus routes. And the practice of naming the routes with the beginning and end names is unhelpful since you don’t know where the bus goes in between. But Google just launched a beta version of Metro Bus routes in Panama City on their popular Google Maps app. Users will be able to enter their start and end destination and have a step-by-step route on how to get there using the bus and metro. It has some errors now but will be getting better. The metrobus is cheap, secure, comfortable transportation. There are so many Uber drivers now in Panama that you only need to take the terrible yellow taxis if you are in a very obscure location. It is also cheaper than taking a taxi as the prices are fixed and not up to the driver’s whim. You get a free ride if you take a bus within 40 minutes! Wow I like that system. By the way-Great Post! Can’t imagine anyone else writing in more depth than this one. The waving of the hand wherever you’re standing to indicate that you want to get on the bus- and the driver responding to it positively, brought back the memory from the morning. Same thing happens here in Nepal except for the card system and free ride. Thanks for the belly popping info! Sorry Marlene. Can’t help you with that. Absolutely this is a classic post, I love to read post like this.. Thanks TravelEater for such a great info.. These are great info thanks! I am going to Panama City this summer. I am wondering if there is a supermarket or vendor at Multiplaza Metromall selling the Metrobus card. Thank you very much! Glad you found it useful. Ask around when you arrive, I’m sure someone can give you specific directions to the closest sales point. Enjoy your trip! your post really helped us. Don’t think we could have figured out the buses without it. Thank you for this post! We’re planning a trip to Panama City next week with our 15-month-old and I was having a hard time finding info on how easy it is to take the bus. Now I’m second-guessing how well it will go with him. Do you think it’s doable? We would take taxis, but don’t want to lug a car seat around with us and I don’t know that I feel safe having our baby car seat-less with the crazy driving I’ve read about. Hope you enjoy Panama City and thanks for asking. It is easy to take the bus. I think the question will be if you are comfortable taking the bus with your 15-month old in other cities, you’ll be fine in Panama City. While the driving is what I’d consider somewhat crazy in North America … the drivers are extremely careful because of the craziness. I think in North America we get into more accidents because we don’t pay as much attention at the wheel because we assume everyone will do what they’re supposed to. In countries like Panama people don’t make that assumption, and so drive much more defensively. Hope that helps your decision! I’d love to hear about your experiences when you’ve returned. Hope you’re having a great time in Panama City. The only info I have is what I would also find on the Panama City bus website. Hope you were able to ask a neighbour for help. 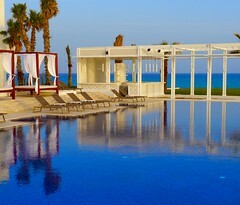 My wife and I spend a wonderful week at the Radisson Summit Hotel & Golf Panama. We were mostly impressed with the super friendly and super helpful front desk, restaurant and housekeeping staff. We had booked in advance OnLine and organized for the hotel’s shuttle service to meet us at Tocumen Airport, which is offered at a reasonable rate. As soon as we walked out of the airport we were greeted by Luis, the shuttle driver, who was holding a very clear sign with our name. Without further ado Luis helped us with our luggage and off we went to the hotel which is about 45 minutes drive from the airport. Luis was very informative and the trip was quite entertaining. At the hotel we were greeted with a smile and minutes later on our way to our room. The room and bathroom were very nice and clean. There is a safe for your valuables, a little counter where you can make coffee and tea, which is replenished every day. Also a little fridge is present. 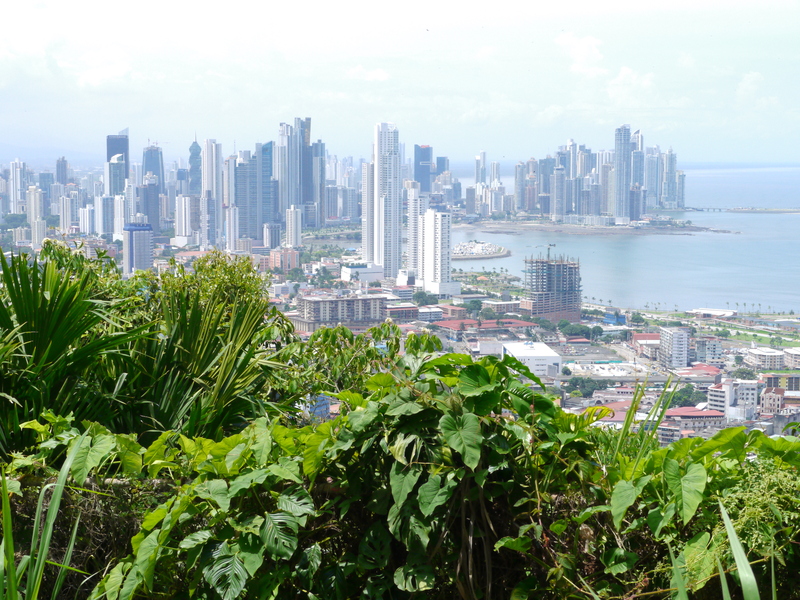 The air-conditioning worked well, which is an absolute must in Panama, as the climate is hot and humid. Breakfast is buffet style with a wide variety of foods (local & international) and fruits to choose from. Also our a-la-carte dining experience in the restaurants was excellent. The only thing we really missed was a little variety store in the hotel, because there are absolutely no shops nearby. If you love golf, tranquillity and peace this hotel is all you need. If you like nightlife and lots of activities this might not be your place as the hotel is about 30 minutes drive from Panama City. 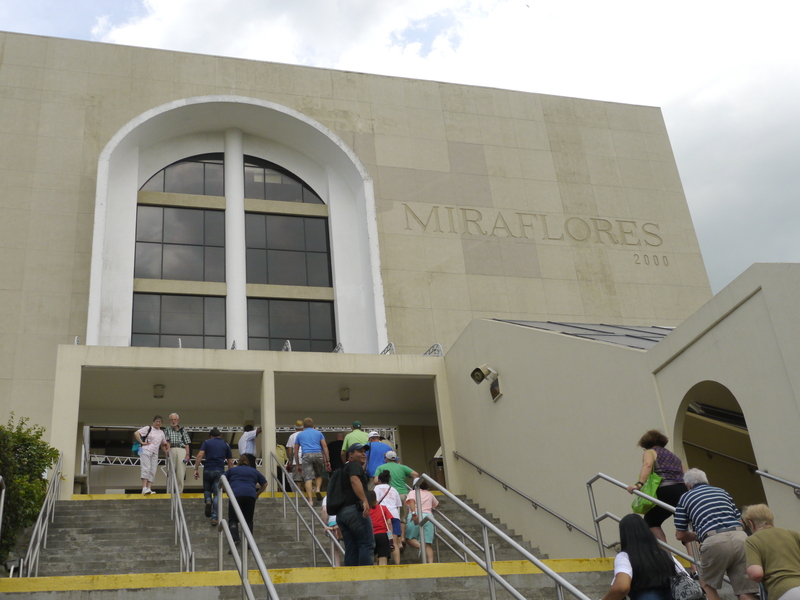 The hotel has free shuttle services to the Miraflores Locks at the Panama Canal, Albrook Mall and Soberania national park. We never took any public transportation, because our Spanish is limited, and we did not feel confident enough. However the hotel staff did bring us in touch with Gervasio Borbua (Jerry) who is a retired tour guide with a good car, and we hired him for a day to show us around Panama City and we can recommend his services. With his permission, his mobile number is (507) 6633-1662. In closing we can definitely recommend the Radisson Summit Hotel & Golf Panama for the friendliness of the staff, food, excellent service, atmosphere, rainforest surroundings and the general comfort of the hotel. Wow Ronny, that’s super helpful — thank you! And anyone else who isn’t feeling up to trying out Panama City’s buses will be very grateful for the recommendation of your driver and that you’ve shared his phone number. Many thanks and happy travels for your next trip ! Thank you Johanna, and many happy travels to you as well. Do you know the frequency of the plaza 5 de mayo – tocumen int airport in the morning? I am taking the bus around 6 in the morning. Thank you! Sorry Karoline, I have no idea. You should check the official Panama City bus site for that info. Ok, I’m from panama and the first thing I will say is. Do not take a Diablo Rojo, I rode one from the terminal of transportation home everyday when I was in highschool, I hated the damn things. Also, do not leave your backpack by the driver if you are taking a city diablo rojo. There is a good chance it might get stolen. Just take it with you to your seat. If you can rent a car, do it, I love my country but public transportation is not worth it. Thanks Anonymous – I’m surprised the diablo rojo is still around. I thought it would have been phased out by now. I’m glad I got to take a ride in one, but I can’t say I’d love it for everyday transportation. Thanks for the update! Do you know the frequency of the plaza 5 de mayo – tucumen int airport in the morning? I am taking the bus around 6 in the morning. Thank you! This was very useful. Thank you. My wife and I are planning a trip to Panama City. We have never been there and after reading your Blog, I feel a lot more confident choosing the Metro Bus to get around the city. I will certainly give an update upon our return. Yes, always nice to avoid the headless chicken routine! :-) Spanish, luckily, is a very forgiving language, so I think you’ll be just fine. Looking forward to your updates! Hey, this is a great post! I’m letting you know that the Rapipass apparently works on the Metro, Metro Bus AND Albrook Terminal now. At least that’s what the front of the card says. I did a lot of experimenting with the transport system yesterday: Diablo Rojos, Metro, Taxi (but no metrobus) and it went… decently. Good thing I’m here for another 3 months, otherwise my panic-purchase of a RapiPass to get a diablo rojo back to my housing would have been a waste. Many thanks Rand for your new info. If you’d like to write an updated post for TravelEater.net, please let me know! Enjoy your stay in Panama ! Thank you! This post gets a lot of traffic and I’m sure people will find the link very useful. Your description is very much appreciated. Thanks.